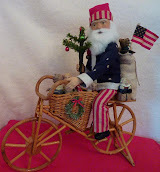 Tonight I am listing several new Christmas items for sale on ebay. Click on the link under the picture to purchase. 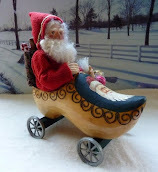 The Santa above is a candy container. Santa separates in the middle to reveal a candy container to place "goodies" for someone special! "Santa and his Friends" is an adorable piece that I just created. The piece can be placed on a shelf and it has a hanger in the back if you would like to place it on a hook. A sweet piece for Christmas!